It’s a common segment on The Daily Show: A correspondent sits down with a group of people to discuss a topic currently in the news. 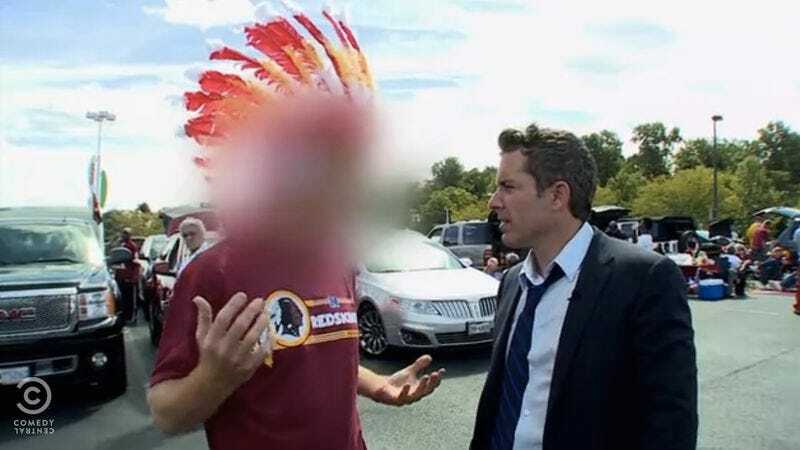 In a recent segment, Jason Jones heard from a group of American Indians who find “Redskins” a derisive and disrespectful name for a football team. In a different room, four fans decked out in Redskins sportswear gave their opinions on why the name is not racist, but in fact a proud cultural tradition. (“If the Redskins name is changed and I have children one day what will I pass on to them?,” asks one.) None of the fans are American Indian, but all claim to have have tiny or unknown—but definitely still there —amounts of American Indian blood. “As one-twelfth Cherokee I am not offended,” says one proudly. Then the group of American Indians joined the group of fans. Tears, shouting, and a Washington Post article ensued, the latter of which details what happened behind the scenes. The fans described how upsetting it was to be “confronted” with a group of people offended because a football team and its fans—i.e., them—use a slur as the team name. They felt uncomfortable. They felt misrepresented. They felt victimized.